Join the Pleural Plaques Register... it's Free! Pleural plaques is a scarring of the lining of the lung. It is caused by asbestos exposure. 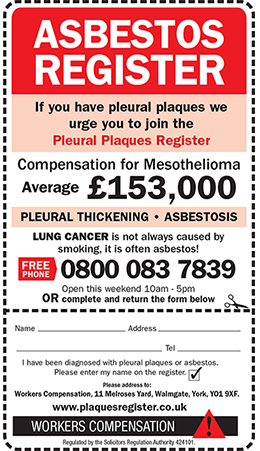 Around 1 in 10 people with pleural plaques go on to develop Asbestosis, Mesothelioma, Lung Cancer or Pleural Thickening. Since 2006 people in England & Wales have been denied compensation for this condition, whereas in Scotland they receive up to £15,000. We think this is unfair. If you have been diagnosed, we urge you to JOIN THE PLEURAL PLAQUES REGISTER. You will receive a registration card. Just fill in our online form or phone us on Freephone 0800 655 6550 and our plaques register team will get to work for you. We will obtain your employment history from the H M Revenue Office and find out where you were exposed to asbestos. We will then keep this on our register and keep you updated.